greening English as a Second Language is easy. 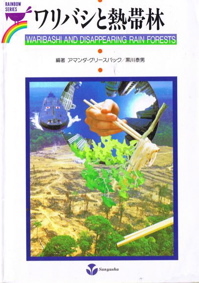 Greening ESL is an approach that "will readily appeal to second language learners concerned with finding a more relevant, interesting and socially significant focus for their efforts at second language acquisition than they may be used to encountering.... Environmental education can prove a rich source of material for purposeful language learning." in every lesson or unit. If you're teaching a language other than English as a second or additional language, then the same principles will hold true for you (see, for example, Environmental Education in French). If you teach English as a first language, please visit Green Language Arts and English. ESL teachers will have to remember that more and more ESL students are going be climate change refugees, seeking new lives and new livelihoods in regions that could be experiencing climate change in their own ways. For teaching English as a Second Language, an outdoor classroom has great potential for fun and learning.... You will be surprised how students become incredibly excited about their learning!... The context for the lesson is automatically set by being on the trail. The communicative opportunities are numerous and students will find it natural to attempt to communicate what they see, feel and hear. Take time to enjoy the magic of seeing a lizard basking in the sun or a butterfly fluttering around your head. Pippin Publishing offers Linking Language and the Environment: Greening the ESL Classroom by George M. Jacobs, Pramaranee M. Kumarasamy, Payomrat Nopparat and Susan Amy (ISBN: 0-88751-092-2). Peter Snashall's ESL Flow, in the UK, offers a large repertoire of ESL lesson plans for teaching environmental issues and problems. Could there be any learning more relevant than learning about one's place in the world, whether home country or new home? Learning a new language allows a learner to expand their sense of place — to see it through new eyes — and to gain a new appreciation for it.